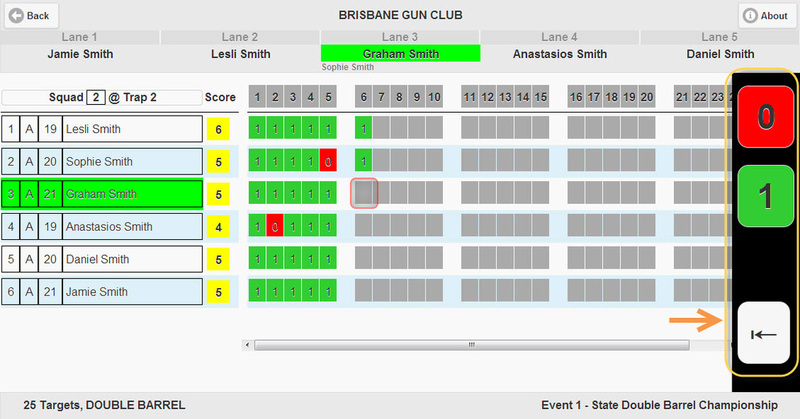 On the left hand side of the scorecard app will appear a list of the shooters in the squad currently being scored. The shooters will be displayed in the order they started shooting. The shooter who is currently shooting will be highlighted in green. After a score has been recorded for the shooter the green highlighting will move to the next shooter to shoot. This allows the scorer to easily identify the shooter whose score is being recorded. At the top of the scorecard app will appear 5 lanes with the shooters names appearing in the lane from which they will next shoot. If there is 6 shooters then the name of one of the shooters will appear as "subscript" whilst they are "waiting" for their lane. The shooter who is about to shoot (and therefore be scored) will be highlighted in green. 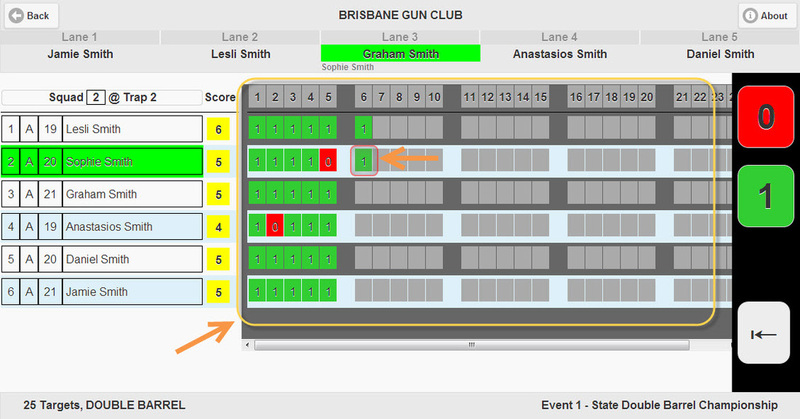 Once the score has been recorded for that shooter the green highlighting will move to the next shooter to score. The administrator can configure after how many targets shooters will "change lanes". Generally this will be every target in Australia but for handicap events it can be set to 5 which means shooters names will only move lanes after they have shot 5 targets. This allows the scorer to easily identify the shooter whose score is being recorded. This combined with the original lane positions shown in the squad details section (left side of the scorecard) allows the scorer to easily confirm the right shooter is in the right lane and that the right score is being recorded. At the right of the scorecard app will appear the buttons used to record the target score for a shooter. The number and label of these buttons will change depending on the discipline currently being scored (details can be found HERE). To record a score for a shooter the scorer presses one of the buttons. Once pressed the score value will "fly" across the screen to the cell where it will be recorded. This provides the scorer with a visual cue that they have pressed the correct button. The score will always fly to the cell with the red border around it. This red border gives the scorer a visual cue as to which target for which shooter is about to be scored. The red border moves to the next cell after a score has been recorded. Given the space limitations on a mobile device not all the targets to be scored for a trap visit can be displayed on the screen at a time. As such the scorer can manually scroll the target scores left and right by placing their finger on the displayed scores and "swishing" them left or right. The scorer does not need to "swish" the scorecard back to it's original position to continue scoring. The scorer can simply hit a score button and the app will automatically scroll the displayed scores to display the block of 5 targets currently being scored as well as the block of 5 targets previously scored. The app will also automatically scroll the displayed targets to the left after the first 10 targets have been scored and then every 5 targets thereafter. In the centre of the scorecard app, in the grey cells, appears the scores for each target for each shooter. The first row is the target number. Note this is the target number for this discipline / visit not the target number for the event, eg if a combination event is shot the app will show 10 targets single barrel and then when the switch is made to 10 targets double barrel the single barrel targets will disappear and the cells to record the double barrel targets will appear labelled 1 to 10. The next rows are the "score" for that target for a shooter. Note this score is the standard recorded value on a scoresheet and not the numerical score result associated with it. For example in a points event a 1 is recorded and displayed for a first barrel hit even though the "score" for that target is 3. On the scorecard app to the right of the shooters name and the left of their target scores is a yellow cell. This cell contains the shooters cumulative "score". This is the final score that will be attributed to the scorer. It increments each time a target score is recorded against a shooter. For example in a 10 target points event where a shooter has five 1's, three 2's and two 0's as target scores their "score" will display as 21. Where a scorer enters an incorrect score they can correct it by pressing the grey "correction" button (the left arrow) under the scoring buttons. Pressing this button will move the "red border" back to the previously scored target. Pressing it again will move back a further target (the scorer can move back as many times as they require). When the correction button is pressed the entire target score area is highlighted grey. It will remain so until the scorer exits "correction" mode and starts real time scoring again. When the correction button is pressed the previously scored target numerical value and colouring are retained. The scorer can then press the button for the correct score. The app will then update the cell with the correct numerical value and update the colour of the cell to match. The red border will move forward and if all corrections have been completed the grey highlighting will clear. The scorer can then continue scoring as normal.